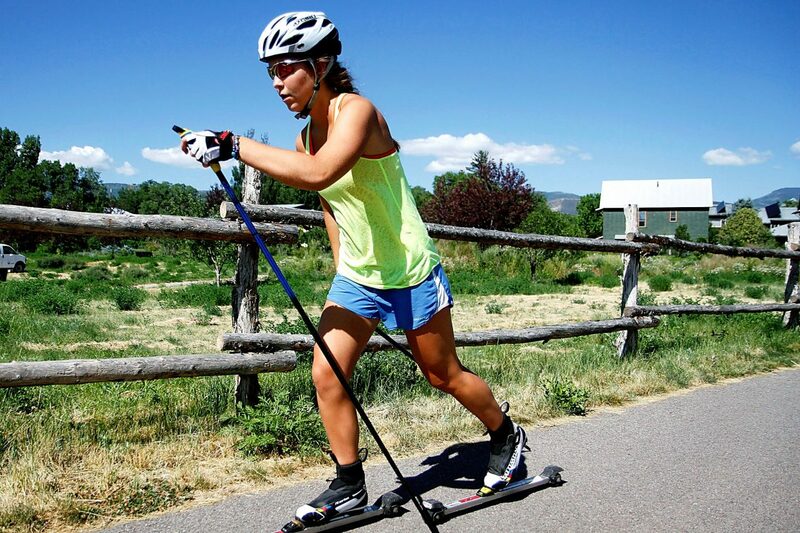 Evelina "Lina" Sutro of Carbondale, a competitive Nordic skier who attends a high school that has a Nordic ski academy in her mother's homeland of Sweden, does her summer training on a pair of roller skis, shown here on the Rio Grande Trail in Carbondale on Thursday. CARBONDALE — Local teenager Evelina Sutro knew going into high school three years ago that she wanted to focus her athletic pursuits on Nordic skiing, and did just that during her freshman year at Colorado Rocky Mountain School. But when the opportunity arose to train and go to school in the sport’s motherland, she couldn’t pass it up. Sutro, 17, has been attending the S:t Mikaelsskolan ski academy in Mora, Sweden, for the past two years and plans to continue there for two more years before she graduates. “The original plan was to try it for one year, but I liked it too much so I decided to stay,” said Sutro, who is home in Carbondale for a few weeks this summer, where she is doing her dryland training before returning to Sweden in August. The ski academy is part of the regular public high school in Mora. The typical school day involves an intensive half day of academic classes, followed by several hours of ski training five days a week with some of the best cross-country ski coaches in the world. Sutro, who goes by Lina, and her schoolmates race on the weekends for the local sports club Ifk Mora, competing in both skate and classic ski styles. Race distances are 5 and 10 kilometers, as well as 1.2-kilometer sprints. Several Swedish World Cup Nordic racers and Olympians have emerged from S:t Mikaelsskolan and Ifk Mora, including Stina Nilsson, who was part of the Swedish relay team that took the bronze medal in the Sochi Olympics in February. Mora is also the finish of the famous Vasaloppet, the biggest and one of the longest Nordic ski races in the world at 92 kilometers. Sutro did have a bit of an inside track to be accepted into the academy. Her mother, Gabriella “Gella” Sutro, is a native of Sweden, and grew up about a half hour from Mora. She also trained to become an alpine ski racer in the nearby mountain region of Åre prior to attending college. She was on the Swedish ski team in 1984 before coming to the United States to attend and ski for the University of Vermont, eventually landing in Carbondale in 1990. The whole family, including their dad, Tripp Sutro, spent a full year in Sweden in 2007. “We thought it would be exciting for her, especially with me coming from Sweden,” said Gella Sutro. “It was only supposed to be for one year, but we’re happy that she’s happy,” she said of having her oldest daughter so far away for all but a few weeks of the year. Lina said it’s hard being away from family and friends, but she’s so busy between school and training that she doesn’t have a lot of time to think about it. “It just makes it really nice coming back in the summer and seeing everyone,” she said. On the competition front, Sutro has managed several top-10 performances at the 5K and 10K distances, and finished 25th out of 10,000 women in a 33K classic ski race this past season. “My goal this next year is to get on the podium,” meaning a top-three finish, she said. Academically, Sutro said Swedish schools are similar in ways to U.S. schools, but students get to pick a major. She chose science studies, so most of her academic courses involve math and science. “The teachers are really nice, but it’s all in Swedish so sometimes things kind of get lost in translation,” she said. As the only American there, she admits she turned a few heads when she arrived at S:t Mikaelsskolan and joined the ski academy. “In the Nordic world, the United States is not a very big competitor,” she said. With the success of two Roaring Fork Valley natives on the Nordic scene, Aspen’s Simi Hamilton and Noah Hoffman, that could be changing. Sutro has a couple of years to figure out where she wants to take her skiing to the next level, perhaps at an American university. And, of course, the World Cup circuit and a future Olympics are fully on her radar screen.